Helmet $50.00 ($27.00 - 8u), Jersey $44.00 (10u-18u need white and black jersey), Pants $19.00, Socks $8.00, Belt $4.00. All players are required to wear matching helmet and uniform. Not due until delivered. Each player will be required to participate in 2 fundraisers. Each Heat family will be required to volunteer in Heat hosted tournaments. The Heat practices indoors during the winter at Softball Central in Fox Crossing, WI. Winter Practice will start the first week of December 2019. Starting in 2017, we do not issue refunds. 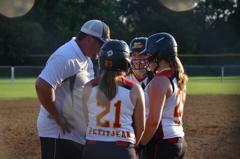 Heat Girls Fastpitch provides year round opportunities for young athletes to develop their fastpitch softball skills in a fun and positive environment. We empower our players to realize their full potential as they compete in this rapidly evolving sport; all while building self-confidence, playing the game they love and creating lifelong friendships.